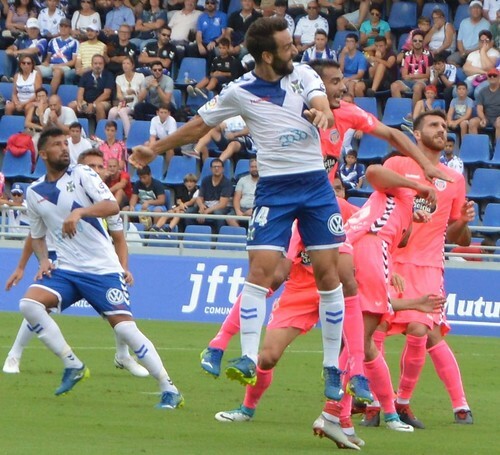 Visitors Lugo were in the pink after grinding out a 0-0 draw but CD Tenerife produced another shocking performance with chances squandered by their wayward strikers. The 10,074 crowds frustrations were rising faster than the shots that flew over the Lugo bar, and there were widespread chants for President Concepcion, and Director of Football, Serrano, to go after assembling a squad that has sleep walked into a relegation battle. Coach Oltra is frantically trying to juggle his pack of players for a winning hand. Nano was back to lead the attack, his expensive strike partner Naranjo was consigned to the bench, and young Tanzanian striker Chilunda didn’t even make the squad after his 10 minute debut as sub the previous week. Paco Montañes got the nod for the starting eleven and was bright and breezy, straying inside from the left. 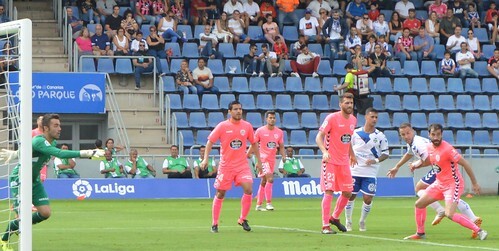 Making space, Montañes laid the ball off to Luis Milla whose long shot was too high. Nano stumbled and could only manage a week strike after good work from Luis Perez. When your down things don´t go for you, Tenerife should have been awarded a penalty after 14 minutes. 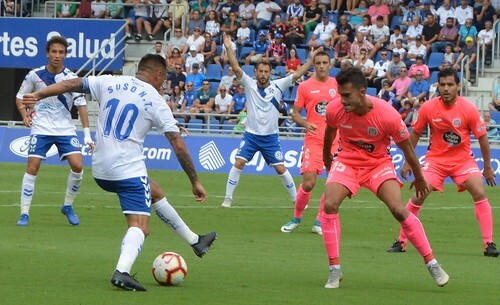 Iriome rose through the youth ranks at Tenerife but was back with Lugo and cut down Camille when the home defender had made a good run into the penalty area. It looked a certain spot kick to everyone except the ref. Home heads started to drop and Lugo´s Dongou cut loose up front with a powerful header that Dani Hernandez took well. 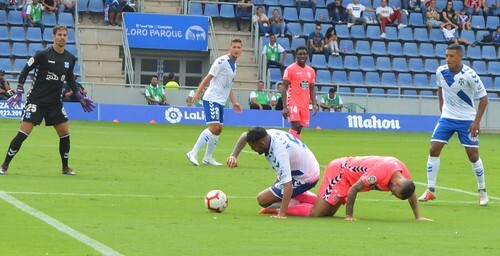 Tenerife suffered another cruel blow when the busy Montañes fell awkwardly after going for a header, and had to go off with an injury to a right leg muscle. Exactly a year ago Montañes had suffered an injury that kept him out for most of last season, this latest setback will side line him for up to four weeks. On came Malbasic to fill the void, he flickers now and then but for a big built player, he doesn´t impose himself on the game and is frequently let down by his ball control and half hearted shots. The big Serbian couldn´t fault Suso for his hard won crosses from the right but his slow responses gave Juan Carlos an easy ride in goal. 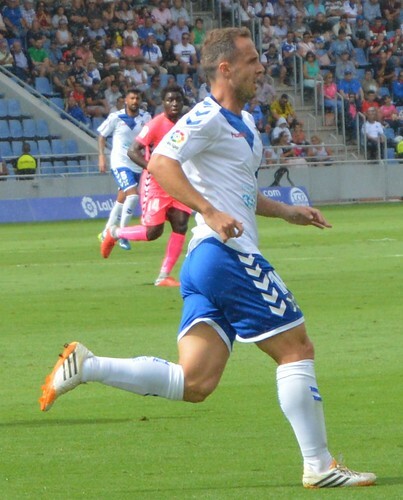 Sergio Gil came more into the game for Lugo, and combining with Dongou they forced Dani to tidy up at the post just prior to the break, and had Carlos Ruiz coming to the rescue for Tenerife just after the restart. Suso must have been getting pretty frustrated, everyone called for the ball when he flew down the wing, he found Malbasic who kicked it straight at a defender, it rebounded out and Camille popped it over the bar. At the other end it took a combination of Camille and Dani to keep Iriome at bay. 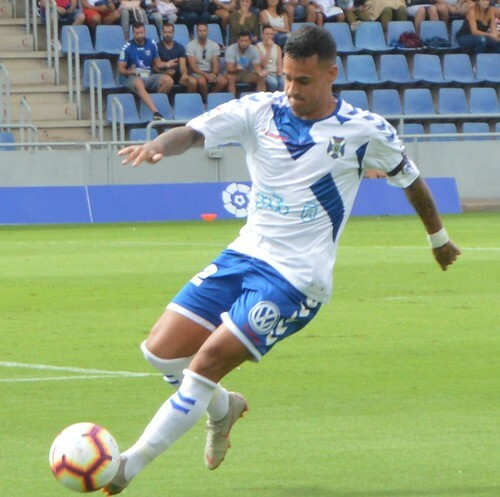 Tenerife were too slow and predictable, bringing on Joao Rodiguez for Carlos Ruiz on the hour helped, at least his pace on the left troubled the Lugo back four. The Colombian’s skills gave Malbasic two more golden opportunities which he couldn’t convert. It’s hard to believe that Tenerife have ever had such a collection of duds in front of goal, thankfully Lugo were not much sharper, Dongou and Gil showed they didn’t have their radar working. Acosta, just a couple of days back from Honduras duty, was the last home change as the negative Undabarrena went off. Naranjo is so poor he can’t even get on from the bench now. Joao put a good ball in from a corner, it came to Nano who turned well in a tight spot and wasn’t far off the target. Luis Milla sent another free kick up and over goalie and post but even with the noon kick off, Tenerife wouldn’t have scored by midnight. The cries of “Concepcion Dimision” continued raining down from all around the stadium as the game fizzled out. The bad luck continued into the week with Nano straining an ankle at Wednesdays training session, making him doubtful for Sundays away game at Real Zaragoza. It’s hard to see how Tenerife can turn the season around, maybe B team hotshot Giovanni will get the call this weekend, otherwise the tea lady will be digging out her boots.